The first-generation Ford Falcon, introduced in the fall of 1959 for the 1960 model year, has many claims to fame, including being one of the highest selling new cars in history – until the Mustang came out 4½ years later. While the Falcon certainly was not the first modern American “compact car,” it was Ford’s first American compact. Ford knew that the new “compact” car had to be much cheaper to build than the “normal” sized cars, so they minimized the weight of the car by engineering a new unit-construction body and a short-stroke inline six of only 144 cubic inches. The engine weighed so little that a healthy man could actually lift it, yet it produced 90 horsepower, more than twice that of the Volkswagen of the day. But the extremely short stroke meant that the car developed little usable torque. When paired with the new, very cheap to produce two-speed Fordomatic, performance was tepid, to say the least. Despite the performance issues, the public loved the Falcon, partly because the interior was purposely designed to be as expansive as a full sized, “normal” Ford family car. In addition, because the car was so inexpensive to produce, the interior trim could be just a tad nicer than what GM put in their competitor, the Corvair. Ford improved the Falcon for 1961 with the addition of a slightly longer stroke, 170 cubic-inch six that produced 101 horsepower; the 144 inch engine was more honestly rated at 85 horsepower. More importantly, torque capabilities were improved with the slightly larger engine. A sportier Futura trim line was also introduced, and Falcon sales continued to do far better than the Corvair for a second near-record year. The 1962 Falcons were joined by the Fairlane, also a unit-body car. The Fairlane’s 221 and 260 cubic-inch lightweight V-8s provided the bones for later Falcon and Mustang small-block V-8s. 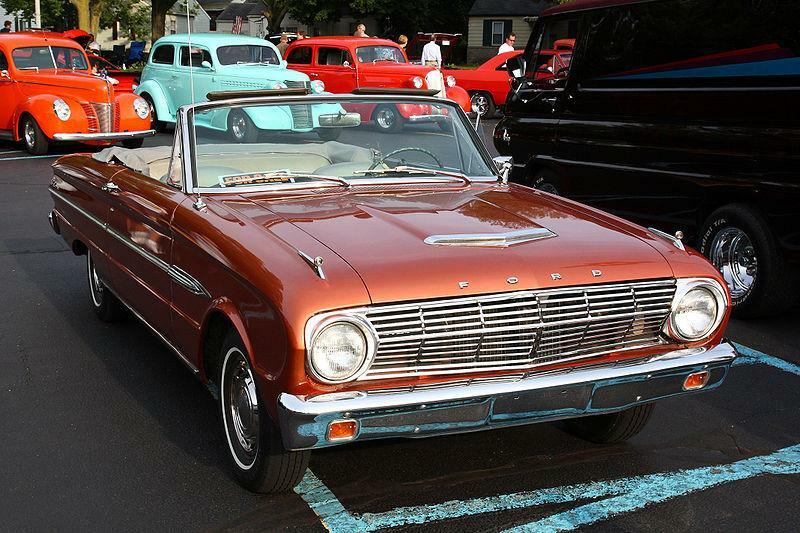 The 1962 Falcon also had to compete against two Chevrolet competitors instead of one; the Corvair had been joined by the new Chevy II and upscale Chevy II Nova cars. In 1963, the Falcon saw some minor detail changes.